When entertaining, it’s always important to keep some wine on hand– and it’s even better if you’ve got a set or two of show stopping stemware sets. While the occasion will likely dictate the type of glass you use, there’s always room for something quirky to get the conversation (and wine) flowing.Whether your goal is to down and entire bottle of wine, have a country soiree, or take wine on the go. 1. Oenophilia Porto Sippers. These glasses are a smidge smaller than your average wine glass. Made for sipping on the sweet port dessert wine, these little decorative hand blown glasses are a great way to end off an already perfect evening of dinner and drinks. 2. 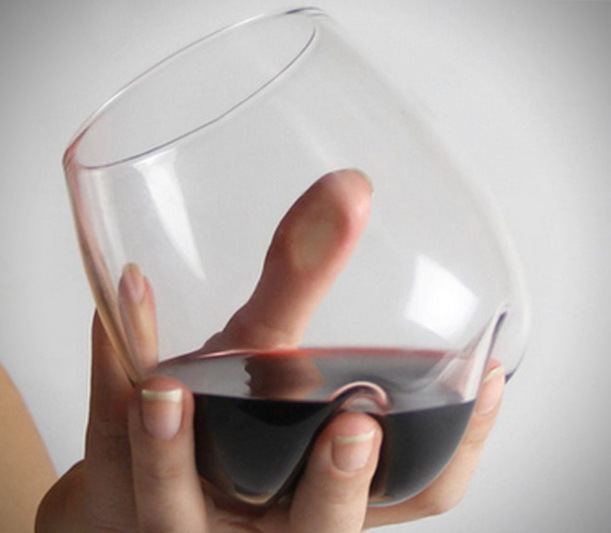 Meld Wine Glass. A hand blown piece that was designed based on the hand to glass interaction. Treating the glass as a glove to the hand, this is sure to be a comfortable fit. 3. Vino2Go Acrylic Wine Tumbler. Great for picnics, the beach, camping or wherever traveling with wine is permitted. It’s the adult version of a sippy cup. 4. Silicone Wine Glasses. An easy and ideal way to transport wine glasses for a camping trip, beach day or just sitting poolside with your unbreakables– they will squish into anything. 5. Tipsy Wine Glasses. In that moment where you’re unsure if you’ve had a little too much to drink– these glasses will be the ultimate test. The bent stem and slightly larger base make them the perfectly tilted yet upright glasses out there. 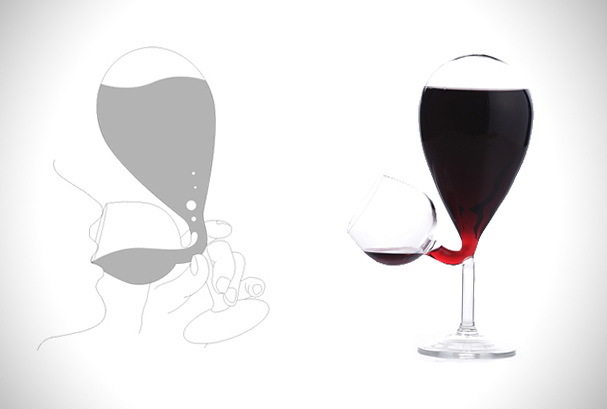 6. rEvolution Wine Glass by Martin Jakobsen. 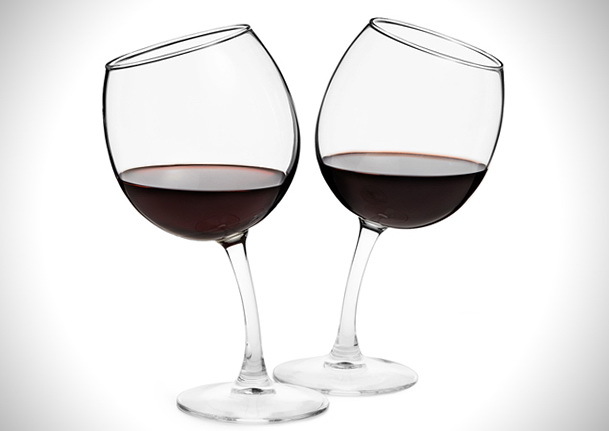 Created in 2011, these glasses beg to be used differently than your average stemware. 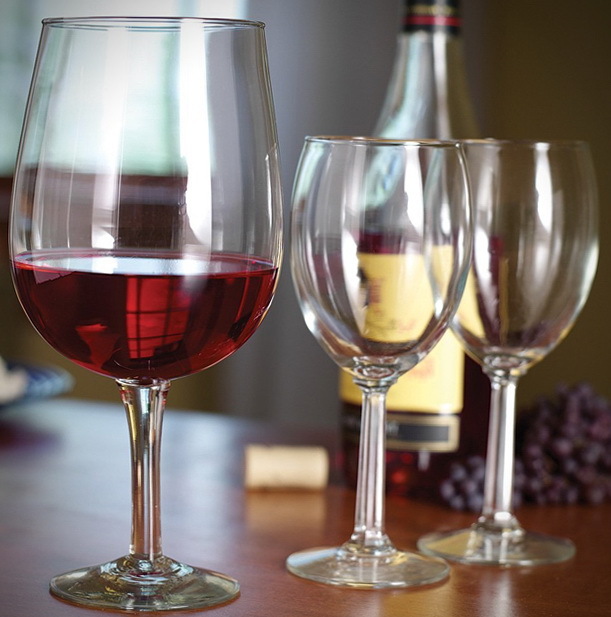 Change your habits of sipping on wine by pouring horizontally and then shifting vertically. 7. 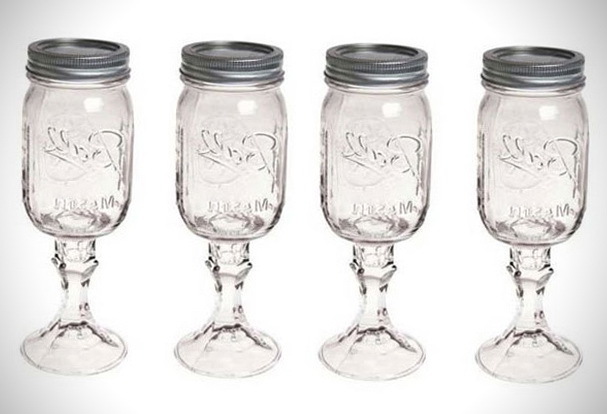 RedNek Mason Jar Wine Glass. A very shabby chic way to enjoy your wine– these are popular for wedding decor and whatever other country inspired soiree you could dream up. 8. Glass Tank Wine Glass. Combining a glass shaped bulb vessel with an attached drinking goblet and you’ve got an instant way to have a self serving wine glass! 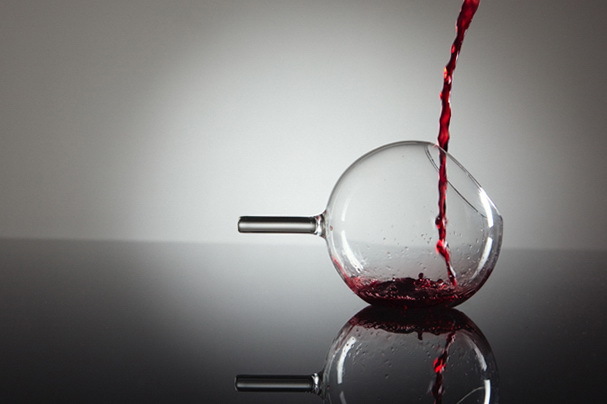 As wine disappears, a controlled amount is released into the sipping area, and as you drink the wine is aerated. 9. 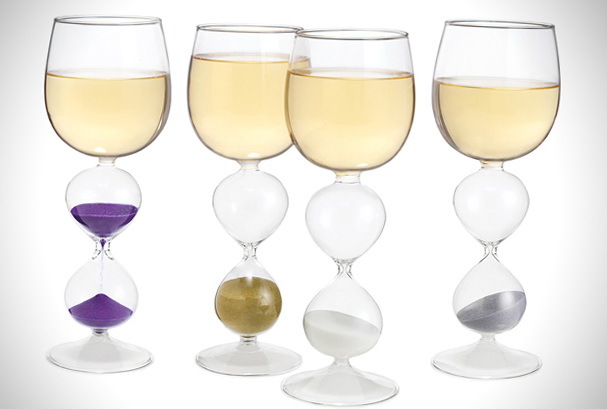 Wine Hourglasses. Pass the time or play a drinking game with these fun and simultaneously decorative glasses that serve a dual function. 10. 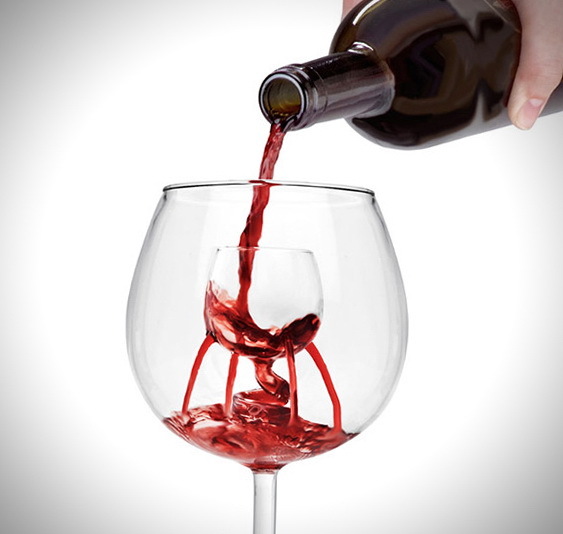 Trevi Aerating Wine Glass. 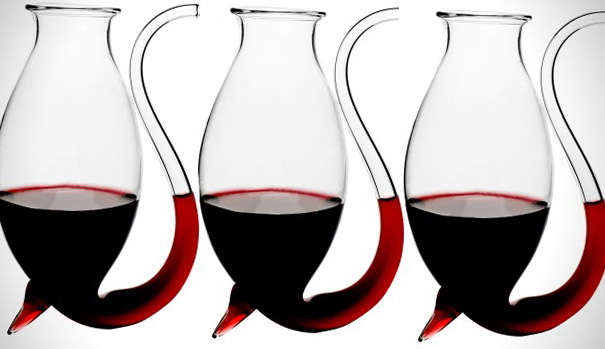 A wine glass that aerates as you pour, without having to utilize an additional attachment to either the bottle or the glass– not to mention, it looks gorgeous. 11. Giant Wine Goblet. 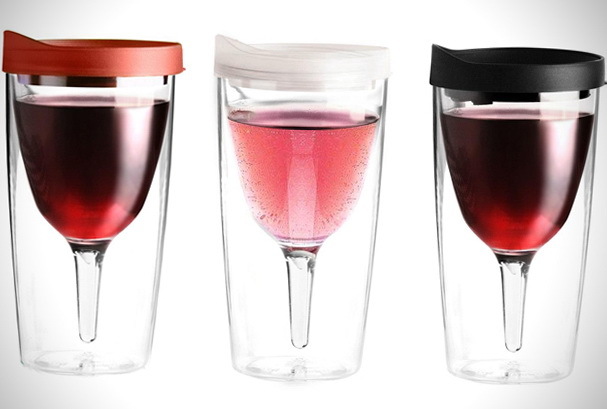 A humongous glass that holds an entire bottle of wine. Give as a gag gift, or use it on the regular (we’re not judging!) for your favorite vintage reds.